Yellow facted CZ fan pendants become gorgeous earrings with just a little chain. It's the ABS annual 12 days of Christmas free projects. Twelve days of last minute holiday gifts! Carmi makes huge resin baubles from an ice tray. Cindy shares her favorite things this week. You might be surprised to find out what they are! Lorelei goes back in time to remind fellow Etsy sellers about Heart-o-Matic! 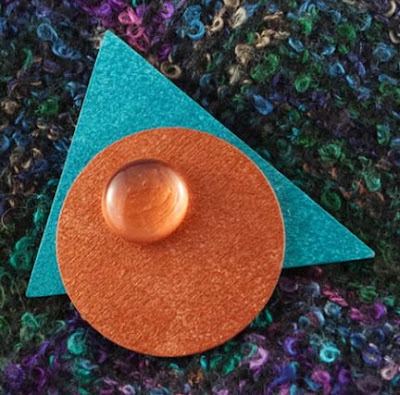 Jean offers a project called Supercool which features a great focal by Dustin Tabor! Melissa shares some whimsical lampwork artistry by Debi Cogwell. 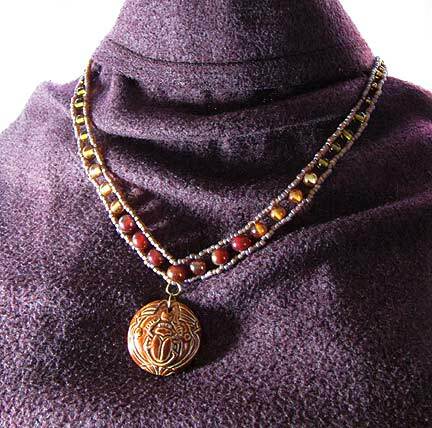 Using a drilled resin piece from Lynn Davis and some filigree, Andrew creates a necklace paying homage to the faeryworld sanctuaries. There is still plenty of time to make some New Year's Eve jewelry! Lisa shares an eye catching bracelet using velvety hearts and chandelier-like egyptian crystals. Here is a totally silly little project for you to do, maybe with one of the little girls in your life! When Mike came back from a conference with a couple of little lizards in his bag (I have no idea why lizards were being given out at a data fusion conference! ), he happily relinquished them to me. I decided they'd look cute in my hair. And after I grow up a bit, I'll probably give them to some of the young girls I know! 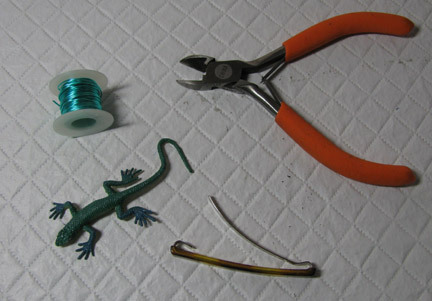 Here's all you need: a barrette, a lizard, some wire, and wire cutters. 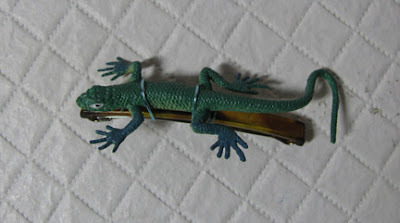 Wire the lizard onto the barrette, tucking the ends of the wire in between the lizard and the top of the barrette so that it doesn't snag your hair. 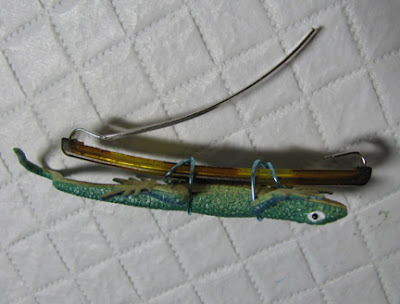 Try to pick wire that either matches the lizard or that contrasts enough to look funny. Add beads if desired. Personally, I couldn't be bothered! 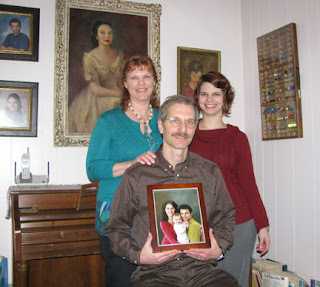 Copyright 2009 Cyndi Lavin. Not to be reprinted, resold, or redistributed for profit. May be printed out for personal use or distributed electronically provided that entire file, including this notice, remains intact. Lisa shares a special gift she received from a friend, SHRINKY DINK earrings!! Still a great product after all these years!! Sparkle plenty with this endless knotted red crystal necklace project! It's the last ABS monthly challenge of 2009. Are you running out of ideas and inspiration? ABS has just the antidote! One shrunk sweater equals felted beaded mitts for me! Cindy explains why she chose Lee Krasner's painting "Untitled" for this month's Art Bead Scene Challenge. Lorelei tested out some cool chain from Rings and Things. Would you like to investgate a lyrical book which explores all areas of your imagination and challenges your creativity? Try Lisa Crone's! Melissa shares a cute find - sterling silver elephant clasps. Thinking deep thoughts, Andrew offers up a sumptuous bracelet and adds a new bronze charm to his shop. Put together a mixed media portrait using crafting scraps and this tutorial from Margot Potter. Fun article with recipes and gift tags for making cookies in a jar. Make your own Christmas crackers this year (don't forget to add your favorite terrible joke for an authentic touch)! A stocking knit in tow colors on large needles is a quick and easy way to hold gifts for the holiday. Use traditional Christmas colors or make one with stripes of the colors of your favorite sports team. If you can string stone nuggets onto wire, and if you can crochet a simple chain stitch, then you can make this pretty necklace. Visit Beading Arts for the instructions! Here's a great easy project that's perfect for kids and fun for adults! We spend lots of time making great votive candles, why not dress them up even more with hand made votive holders? Add a cute penguin to your holiday cards with this step-by-step drawing tutorial from Helen South. Use a few wire techniques to turn two lampwork snowmen beads into some holiday jewelry. These literally take minutes to make. Recycle a greeting card and create a holiday album using materials you already have around the house. These three dimensional stand up cut paper trees can be used for table decorations or winter scenes. They're cut just like snowflakes from regular paper. If you're in a pinch for some holiday cheer upon your ears, then these simple seed bead earrings are just the holiday miracle you've been looking for. With just a little wire and a handful of beads, these can be made in just minutes. When you don't have the fragrance of a real Christmas tree, fake scents just don't do it. 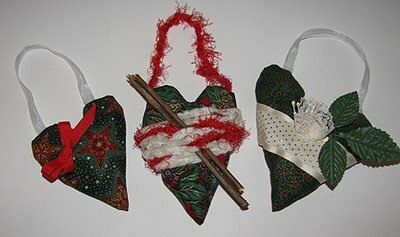 Make a batch of these ornaments every few years and hang them from your tree, the scent will last for two or three years! Want to Join Make it Merry to show off your holiday crafts? We will showcase your crafts and recipes of all holiday traditions. Learn more. 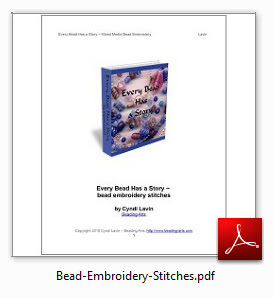 Pam T is the winner of our book giveaway, Seed Bead Fusion! Congratulations!! Pam wrote: "what fun! 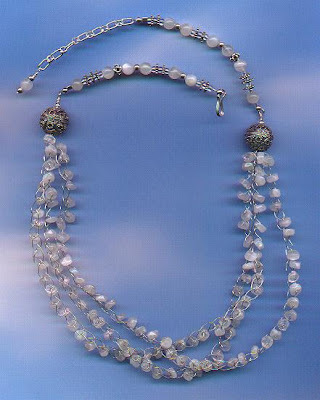 i love to bead leaves, any and all kinds...."
Making a necklace like Moonstone Rainbow is very similar to the instructions previously given for making Blue Bells. I strung moonstone chips onto 28 gauge wire and crocheted a chain that ended up being folded into thirds. Most of the technique is outlined in the tutorial for Blue Bells, and I suggest reading it now if you haven't already! 1. Using 20 gauge wire, twist around the ends of the crocheted sections to keep them together, and take the wire through a large bead on each side. Create a wrapped loop. 2. Crimp a piece of beading wire like SoftFlex to each wrapped loop. Add beads for a strand that's as long as you desire on each side. 3. Crimp one beading wire strand to a hook, and the other to the end of a length of chain. 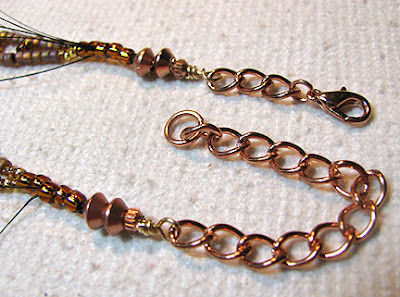 Make a dangle on a headpin, and attach it with a wrapped loop around the free end of the chain. Easy peasy, huh? Kitty is the winner of the Artbeads.com giveaway! I love tigers eye beads! They come in so many shapes and sizes; I can't get enough of them! Each representing a different spectrum of lampwork glass, Andrew shares the new additions to his bead collection from two different artists. If you find yourself in need of a quick holiday gift, don't overlook memory wire! With this simple design, you can make one for all your friends. Thinking of making some beaded ornament covers? Then you'll need to know the size bulb to use too. 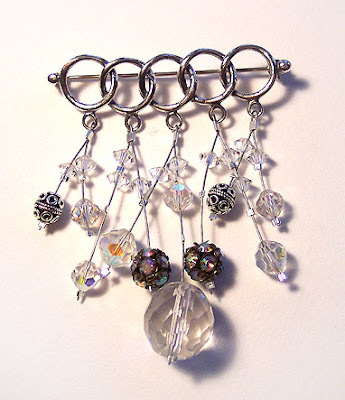 It's the first day of Art Bead Scene's annual Twelve Days of Free Projects! Barbe gets all steamy over the new Steampunk Style book! Carmi wonders if anyone else is working on Spring. Inspired by Grandma's necklace, Cindy creates an edgey look with CZ's. Melanie shows a sneak peek of a pair of earrings she made for the upcoming book Steampunk Style by Jean Campbell. Jean shares 3 easy tips for making holiday gift production a little less stressful. Katie's making tons of earrings this season. Here are a few fun ideas for your own last-minute gifts! Lorelei is saying Thank you and Merry Christmas by giving away a gift certificate to artbeads.com! When you check out this ornament kit which is available for you to make, it will REALLY put you in the spirit! Oh wow, oh wow, oh wow!! 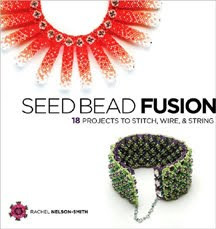 Back in September, I wrote a review of Seed Bead Fusion by Rachel Nelson-Smith. Well, I now have a copy to GIVE AWAY!!! As I wrote in my review, Rachel enjoys mixing it up. 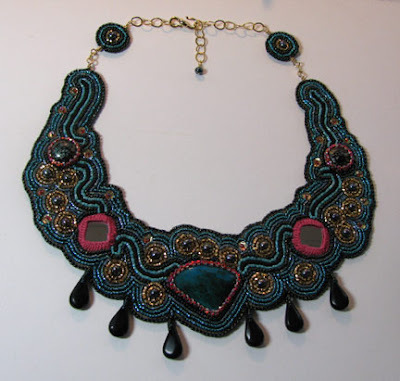 Even if you don't have a lot of experience with seed beads, I can still recommend it to you. 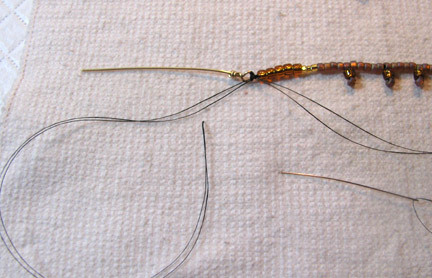 As complicated as the projects appear, they are all based upon a few very basic stitches and wirework, all of which are profiled in the techniques section. Even if you've only started beading recently, if you are willing to practice the basics, you'll be able to follow along with Rachel's instructions. There are very clear illustrations and photos to take you through each and every step. So here's my question for you: if you work with seed beads already, what do you most like making? If you don't work with them yet, what would you most like to be making? :-) Leave me a comment below, and you will automatically be entered into the drawing, which will take place next Wednesday evening. 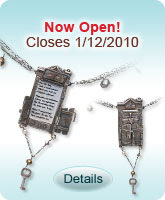 Note: I've also got giveaways for different books starting today, Dec 9, 2009 on Jewelry & Beading and on Mixed Media Artist. Feel free to sign up for those too! As regards FTC disclosure guidelines: I have received this book free of charge from Interweave Press in order to be able to offer it free to you. I have not been paid for my endorsement as it pertains to the products received. I’m making some more of my fabric stuffed hearts, but this year, I’m going to add beads! Here are the instructions for them, on my mixed media art blog. So what are you making? You can either post your answer here in the comments, or even better, send me an email with your a list of what you’re making, a link to your site or blog, and a picture of your work if you can…even if it’s in process! Send it to cyndi @ b5Media.com (remove the spaces), and put BA Gifts in the subject line. 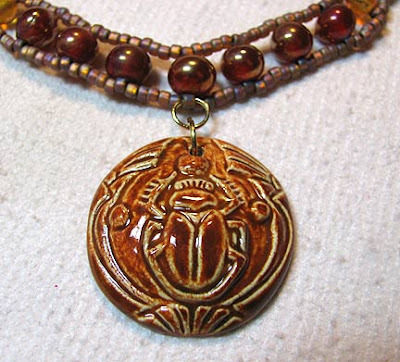 After several false starts, I finally came up with a beaded necklace style that suited the gorgeous Deco Scarab pendant that my friend Melanie Brooks sent me to play with. 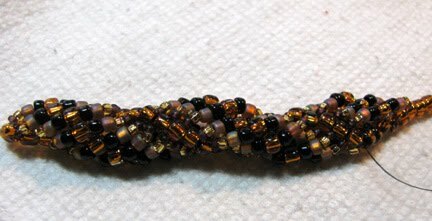 If I do another of these, I will probably make one change, and that is to look for size 6/0 seed beads for the base strands that are rounder, less cylindrical. The rounder shaped beads generally sit together in a smoother line than the cylinders, oddly enough. Still, the weight of the pendant holds the beads straighter when it is being worn than is shown in the photo above, so I'm satisfied with it for now! 1. On a doubled Nymo thread, string enough beads to create your base strand. As you string, add drop-down beads at regular intervals in this manner: string 5 base strand beads, string larger bead plus another base strand bead, go back up through the larger bead and through the last of the 5 base strand beads added above. Your needle should exit going the same direction as before so that you can add the next 5 beads. 2. Create two wrapped loops with 3 inch pieces of wire. Tie them onto the ends of the base strand. Leave the tails long so that they can be worked into the beadwork later. 3. 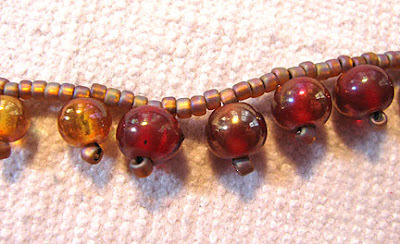 Start down the base strand again, this time splitting off and adding 4 beads in between each of the drop-down beads from step 1. 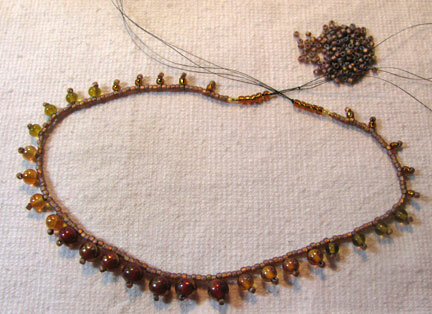 Add 5 beads in between each set in the from 5 to 7 inches so that the piece will curve nicely when worn. 4. 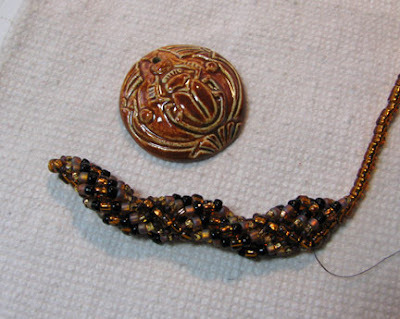 Slide a couple of large holed beads or a bead cap over top of the wrapped loops. Add a smaller round bead, and create wrapped loops around the chain and clasp. 5. 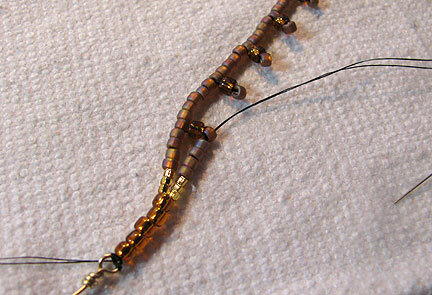 Attach the pendant to the center bead by slipping a jump ring into the size 6/0 bead in the lower base strand. Use another jump ring to hang the pendant. Glue the knots and trim. As regards FTC disclosure guidelines: I have received the Deco Scarab pendant free of charge from Earthenwood Studio in order to write an honest review and/or create a project free of charge for you. I have not been paid for my endorsement as it pertains to the products received. Artbeads.com has also made it possible for me to give away a $25 gift certificate here on Beading Arts. If you win, maybe these CZ beads are something you'd like to have. You can choose anything you want from their online catalog! To sign up for a chance to win the $25 gift certificate, leave me a comment below, telling me what type of beads or supplies you'd most like to have. In a week, I'll be randomly drawing a winner from all the commenters below. Please make sure you type your email address correctly! And Artbeads.com has another way for you to win too: visit their facebook page and sign up there to win a $100 gift certificate! As regards FTC disclosure guidelines: I have received the CZ beads shown free of charge from Artbeads.com in order to create a project free of charge for you. I have not been paid for my endorsement as it pertains to the products received. 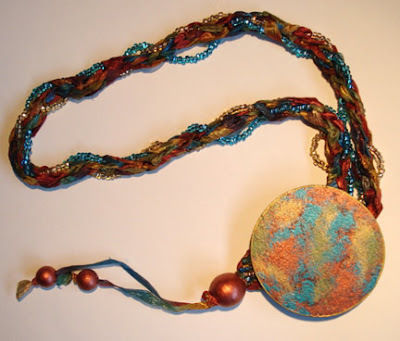 Cyndi is sharing a series of Gift Guides for handmade jewelry lovers! The ever breathtaking beadmaker Kim Miles pulls out all the stops for the Holidays and gift giving. But that is not all! If you have the "secret word" on the secret day" every week, you get a fab discount! Give a beaded jewelry gift that gives twice. Be Inspired! 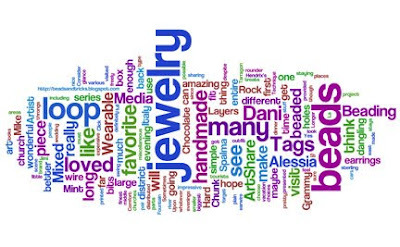 Think about creating jewelry that tells a story. Carmi is selling jewelery in a show for the first time and is trying not to "jinx" her favorites! Meet the newest addition to the Through the Looking Glass Nugget Charm Family - Alice Blue! 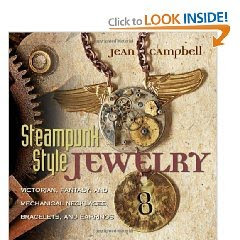 Jean discusses how Steampunk jewelry design fits into a larger "Poetic Couture"
The newest issue of Make It From Scratch is out today! Find fabulous treats to cook and to make in this post! 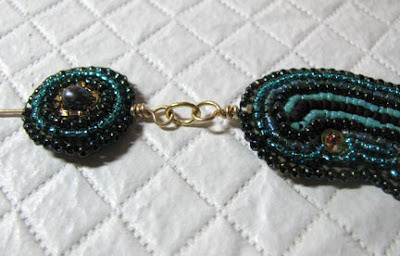 Well, I started working on a beaded strap from which to hang one of Melanie Brooks's gorgeous new pendants. Once I had a few inches done though, I decided that this spiral was going to be much too thick and ornate to be a good match for the ceramic Deco Scarab. Here is my original tutorial for the spiral stitch (check out those terrible hand drawn sketches!). You'll notice in the image above that I've strung the entire central core first and then just added the spiraling loops. It can be done either way, but the trick is to make sure the loops you are adding are just a bit shorter than the core beads that you're adding them to. This is what makes the piece kink slightly and twist around. 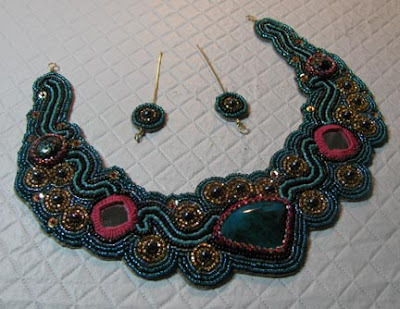 The pattern I used was this: central core from size 6/0 seed beads. The loops each contained 1 size 15/0, 1 size 11/0, 2 size 8/0, 1 size 6/0, 2 size 8/0, 1 size 11/0, and 1 size 15/0. Each loop spanned 6 of the core beads. I then brought the thread back down through 5 of those core beads and exited in order to start the next loop one bead higher than the previous loop. The Lady of Shalott - finished! Melissa is thankful for generous friends - who share their beading supplies! Stop by A Bead A Day for a wonderful week of cubic zirconia sparkle sponsored by Artbeads.com. Ideas are always welcome! It's is so easy to get into the holiday spirit when you have the perfect lampwork beads to get you there. Just think of all the jewelry possibilities. Are you a Twilight Fan? If yes, then check out the Twilight inspired jewelry on the Art Bead Scene! 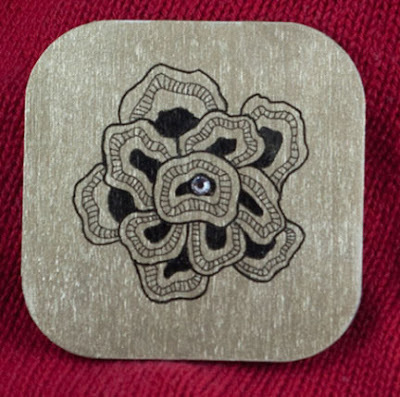 Carmi uses embossing powder to make a bird pendant...a fun idea! It's Double Dippin' Week - a week full of ideas for the Double Dips. Try a necklace and become "Entwined." Melanie gives her review of Enchanted Adornments, and gives a reminder to enter the Art Bead Scene monthly challenge for your chance to win a copy of it and some other great beads, including new Earthenwood beads! Ah, Etsy! So many of our problems solved by visiting Etsy for gifts for our dearest friends at this time of year. Take a look at this premade pendant, which also comes in a kit so you can teach yourself if you prefer. It's all jump rings and it's all beautiful. 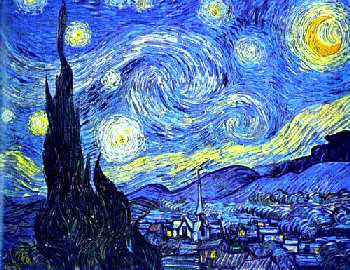 The Alchemist's Star! Happy Thanksgiving, folks. Welcome to another edition of Make it Merry, where talented crafters share their holiday how-to's. Sherri Osborn will show you how to create a cute snowman face using a clear, glass ornament. It's a great project for the whole family. Get a glimpse of this pine cone gnome at the Recycled Crafts blog. It's a cute reason to collect a few pine cones around the yard. Try your hand with pendant making this year with a little help from some winter foliage. The Beading Arts blog will show you how. Handmade paper not only makes a great gift for the avid scrapbooker in your life, but you can also create tags and cards for every present on your list. Marion Boddy-Evans shows us how. Get down to the true meaning of Christmas with this simple cross stitch pattern from Connie G. Barwick. Tammy Powley shows us how to make these cute mitten earrings using lampwork beads. This cute two-color Christmas stocking is a breeze to knit, even if you've never knit a sock before. Worked with bulky yarn on big needles, it will be done and ready for you to embellish in no time. If you are looking for something a little different when it comes to counting down to the holidays this year then take a look at this pyramid box garland. Use the free template to make the boxes and decorate them with your favorite festive stamps. Have a little gift to give? Check out these free printable miniature gift boxes for small gifts or advent calendars from Lesley Shepherd. Instead of a traditional Christmas card, you could go with something a little more contemporary this year. Helen South has tips on how to create a manga style card.